Parachute Design tackles a complete corporate rebrand and responsive website design overhaul with one of Toronto’s leading artificial intelligence designers. A custom responsive WordPress website design for a leader in artificial intelligence design. Toronto has become an incubator for burgeoning artificial intelligence design and development companies. With this exciting industry on our doorstep, we were chomping at the bit to work with Wysdom through their digital rebranding and new website design. As one might expect, two creative agencies working together offered a fun and relaxed environment allowing the creative web design to take centre stage. 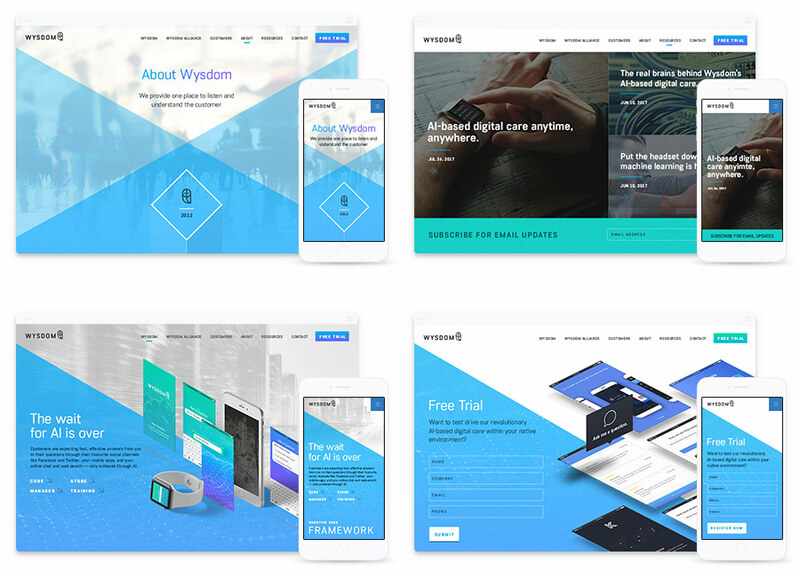 Corporate rebranding – formerly known as Crowdcare, Wysdom underwent a complete corporate rebranding as they planned to expand their AI services to a broader spectrum of clients. Parachute Design played a fundamental role in taking the early branding work Wysdom had created and built upon this foundation to create a beautiful new website user interface. A complete website redesign and development – as the core of our project with Wysdom, the website design overhaul encompassed multiple goals. The existing website was still in relatively good shape and worked quite well. The main reason Wysdom required a website redesign was that the technology industry changes so fast and significant emphasis is placed on corporate image and showcasing the “latest and greatest”. Having a beautiful, custom-made website design as the face of our digital brand is crucial. Together, our teams set out to create a truly responsive and engaging new website to better communicate the benefits and inner workings of Wysdom’s technology. To kick things off, we dove right into the depths of Wysdom’s existing website analytics to learn more about who’s currently using the website, how they’re viewing it and what website content they’re most interested in finding. This data is critical in laying the foundation for our conversion strategy for the new website. Understanding how real world leads are using the website and what information they’re most interested in helps our web designers create more effective calls to action and conversion points. All this groundwork would become more prevalent during wireframing and design. Following our study of the user data, our website strategy team analysed top competitor websites to understand the companies Wysdom is competing against for attention and how they’re approaching their digital marketing. From this research, we gathered insight into search engine optimisation strategies and a thorough understanding of how we should approach the new website design for this technology company. This approach allows us to not only set the bar for website design amongst top competitors but blow them out of the water. With the bulk of our research complete, we moved into our web design strategy phase. Our first step was to design a brand new sitemap and reconfigure the website navigation to create a more efficient user flow and bring valuable information to the forefront. During our site mapping exercise, we worked with Wysdom to identify where each web page will live in the new website architecture and how they will all be linked together to create a winning user experience. Following our sitemap design exercise, website wireframing became our focus. During this phase of our website design strategy, the overarching page architecture began to take shape. Throughout this stage, we involved our clients in the process as much as possible. Sharing our rationale and experience in creating page architecture not only helps our clients better understand our approach to building successful web design, but we find that it also helps our clients create or refine their website content to better perform on the new website. Our interactive prototyping tool helps streamline the wireframe process by allowing our clients to securely log in to view wireframes in context and experience the web page architecture in context. Additionally, both teams can leave comments directly on the wireframes and tag individual team members on both sides of the project. The website design phase is always where both our team and our clients have the most fun and collaboration in the project. Relying on all the groundwork laid earlier in the project to establish critical benchmarks, conversion strategy and navigational and page architecture, the initial web design concepts begin to take shape. The conceptual design work is posted to our online prototyping tool so that both teams can view the user interface design in context and collaborate more efficiently throughout the revision process. Once the website design concept is formally approved, our creative team begins work on the website design expansion to cover all unique page layouts we established during wireframing. 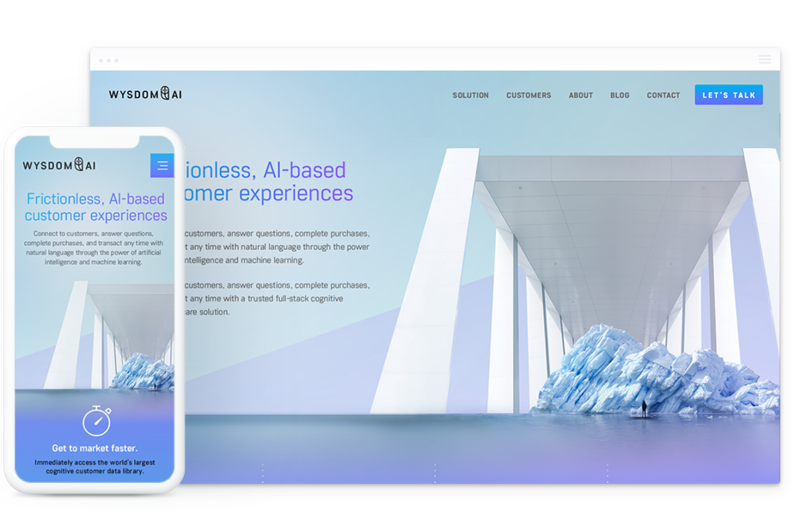 A key challenge we faced with the new web design for Wysdom was finding a creative and engaging way to show their product – artificial intelligence. Given that their sole product is not something we can see or touch, and we’re not able to live client applications we dug in and created beautiful isometric user interface representations that weightlessly float throughout the responsive website design. This solution allowed us to give visual representation to Wysdom’s product, without breaking any agreements they have with their clients. As Wysdom was using the new website design to overhaul and evolve their corporate branding entirely, our design team took special care to select and massage a beautiful, unique colour palette that is carried throughout the website and supporting graphics. In addition to this fundamental change, a new corporate typeface was integrated within the design accompanied by brand new iconography throughout the website. Throughout the website design process our web development team waited patiently to get their hands on the new artwork. Like all our custom website design projects our web developers are in the thick of things throughout the strategy and design phases to help foresee potential development challenges or user experience gaps. Having all of our web design specialists working together from start to finish allows us to create winning design for our clients that hit the mark from the start. As we neared the final stages of user interface design, our development team began their work on the custom WordPress backend that would support the new website. Fully engaged in the project from day one, our developers were able to carefully craft a custom backend allowing Wysdom to efficiently manage their new website on a day-to-day basis in addition to building in some future-forward options to allow for natural expansion as Wysdom’s digital marketing needs grow. As our web development team neared the beta release date, we began entering content and combing through the website enhancing the on-site search engine optimisation. In addition to the website design and development best practices that make all our website appealing to Google, our content entry people take the time to carefully massage the vital keyword rich headings and meta content that live behind the scene and help drive search engine rankings and performance. Following our thorough quality assurance testing, Wysdom approved the new website for launch just in time for their press release announcing the corporate rebrand to the world. Following our advice, Wysdom opted to utilise a managed WordPress hosting platform to take advantage of all the automation, security and support available to WordPress websites today. We quietly migrated the polished website from our development environment to the staging server for final quality assurance and testing. Once everyone was confident we were ready for rollout, we flipped the magical DNS switch, and all systems were online. Once the new Wysdom website was up and running on the production server for about a week, we circled back with our client to hand over the keys to their new promotional tool and provide a tour of the new WordPress backend. During our online training, we also advised our client on daily best practices to follow when managing the website and publishing original content that would enhance their search engine optimisation efforts. The final stage of our website design and development process is post-launch support. For 60 days our team is available to tackle any unforeseen issues that may arise post-launch or lend a hand in working out any digital marketing ideas that come to life after the new website is live in the wild. Parachute Design has been at the forefront of the Toronto web design industry since 2003. To support our professional custom WordPress web design services, Parachute Design also offers a wide range of graphic design services including corporate branding and custom logo design. To learn more about our web design services or request a quote, please complete our web design proposal planner or contact our Toronto web design company at 416-901-8633. Creating a successful website design can be a challenging task without the right design experience. Let us help you put together a plan to create a winning website, the first time.